The U.S. Census Bureau has just released its annual poverty report. The report claims that in 2013, 14.5 percent of Americans were poor. Remarkably, that’s almost the same poverty rate as in 1967, three years after the War on Poverty started. How can that be? …When Johnson launched the War on Poverty, he wanted to give the poor a “hand up, not a hand out.” He stated that his war would shrink welfare rolls and turn the poor from “tax-eaters” into “taxpayers.” Johnson’s aim was to make poor families self-sufficient — able to rise above poverty through their own earnings without dependence on welfare. The exact opposite happened. For a decade-and-a-half before the War on Poverty began, self-sufficiency in America improved dramatically. For the past 45 years, though, there has been no improvement at all. The final two sentences of that excerpt are the most important words in Robert’s column. We were making lots of progress in the fight against poverty in the 1950s. That’s because we relied on the private economy and self sufficiency, as seen on the right side of this Chuck Asay cartoon.. But once politicians decided government was responsible for fighting poverty, progress ceased. Why did progress stop? Because, as Robert explains, the welfare state creates a dependency trap and enables self-destructive behavior. The culprit is, in part, the welfare system itself, which discourages work and penalizes marriage. …The welfare state is self-perpetuating. By undermining the social norms necessary for self-reliance, welfare creates a need for even greater assistance in the future. President Obama plans to spend $13 trillion over the next decade on welfare programs that will discourage work, penalize marriage and undermine self-sufficiency. By the way, being “poor” in America rarely means material deprivation. Most Americans who live in “poverty” have much higher living standards that people elsewhere in the world. The actual living conditions of households labeled as poor by Census are surprising to most people. According to the government’s own surveys, 80 percent of poor households have air conditioning; nearly two-thirds have cable or satellite television; half have a personal computer; 40 percent have a wide-screen HDTV. Three-quarters own a car or truck; nearly a third has two or more vehicles. Ninety-six percent of poor parents state that their children were never hungry at any time during the year because they could not afford food. …As a group, poor children are far from being chronically undernourished. The average consumption of protein, vitamins and minerals is virtually the same for poor and middle-class children, and in most cases is well above recommended norms. …the average poor American has more living space than the typical nonpoor individual living in Sweden, France, Germany or the United Kingdom. By the way, don’t be surprised by the final sentence in that excerpt. Most people have no idea that Americans have far higher living standards than their cousins in Europe. 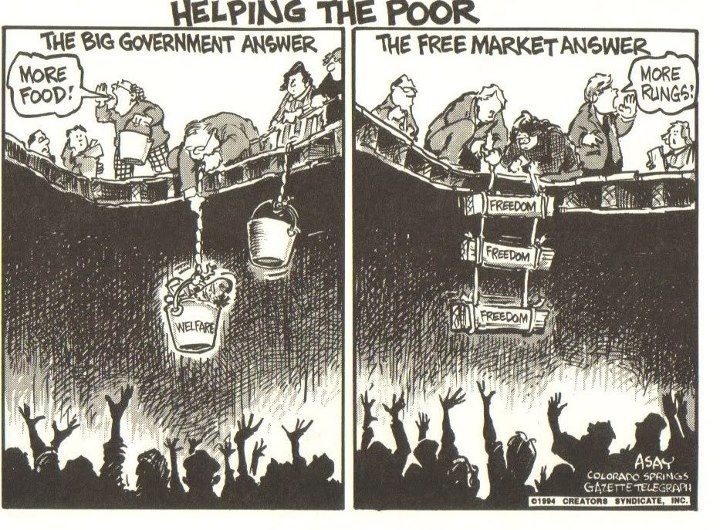 For more information on how best to help the poor, watch this video from the Center for Freedom and Prosperity. Bono actually agrees that capitalism is the best approach to fighting poverty. Too bad the Pope lacks the same insight. P.S. Here’s a map showing which states have the biggest welfare benefits. P.P.S. If you want to see an utterly dishonest approach to public policy, read how the OECD tried to exaggerate poverty in the United States, so much so that it even tried to imply that there was more poverty in America than Greece. P.P.P.S. Thomas Sowell has wise thoughts on how the welfare state hurts the less fortunate. P.P.P.P.S. Some libertarians have suggested a “basic income” to replace the dozens of inefficient and failed welfare programs in Washington. For what it’s worth, I think there’s a better alternative. Czasy, kiedy czteroosobowa rodzina z ogromnym towarem podróżowała małym fiatem, bezpowrotnie upłynęły. zabawki chłopczyków, wdziania, wózki i masę innych rzeczy. Woląc podróżne auto dla familie, postaw na przydatną przestrzeń i bezpieczeństwo. globalny szczebel wyposażenia. Podróż z dziećmi powinna być poręczna jednocześnie dla dzieciuchów, jak i rodzicieli. Wygodne auto ręczy słabsze postoje, sielski sen pociech i sposobność na długie pogaduchy rodziców. wypraw, oraz weekendowych wypadów rodziny przyzwoicie podnoszą nie na piękno, elegancję i luksus, natomiast na wygodę. First, it would get the federal government out of welfare, with states federalising the additional +100% and the tab if they so desire. Second, that basic income would add a progressive element in a new flat tax, making it politically acceptable. Gone would be disincentives against earning additional income. Everyone would keep 75% of income earned. Fourth, a basic income will allow us to transition from current entitlements (which would be reduced by the amount of the basic income for no net change), into personal retirement accounts, over a period of time (30 years). Truly a prescription for economic and social disaster until more people pick up on what is really being pushed.